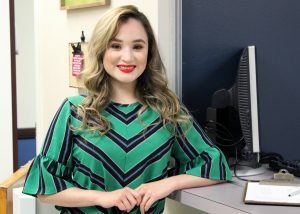 (HARLINGEN) – Iris Juarez graduated in Summer 2018 from Texas State Technical College with an associate degree in Business Management Technology. The 21-year-old returned to TSTC to complete her Academic Core, where she also holds a 3.3 grade-point average and is a student orientation leader with TSTC’s New Student Orientation office. The San Benito native also serves on the TSTC Service Squad, Leadership Academy and has taken on the responsibility of leading TSTC’s voter registration initiative. After finishing my classes at TSTC I will transfer to the University of Texas at San Antonio to pursue a bachelor’s degree in General Business Administration with a minor in Communications. I currently work part time at my parents’ air conditioning business. This is giving me the experience I need to one day make my dream of managing a cosmetic or logistics business or even opening a business of my own. My greatest accomplishment while at TSTC was applying and getting the student worker position with the New Student Orientation office. It is because of this job that I am now involved in several on campus organizations, I’ve grown personally and professionally and I’ve created long-lasting friendships. The greatest lesson I have learned is to not underestimate myself and to always pursue the challenges that scare me. If something doesn’t scare me, then I’m not growing. There are two people on campus who have had a great influence on my success. First it’s my Business Management Technology Instructor Steve Szymoniak. He has taught me to be bold and not be afraid of a challenge. He’s a go-getter and he aspires his students to be go-getters also. Next is Student Orientation and Student Activities Coordinator Larissa Moreno. She has helped me grow and reach out of my comfort zone. She challenges me and teaches me confidence. My advice for future TSTC students is to get involved and join campus organizations. Doing this can change your entire college experience, you meet a great network of people and try new things. Also, take advantage of the resources and services TSTC offers its students. There is so much available.